I am writing this guide with the intention of creating a comprehensive GW resource. This will begin by answering the most COMMON questions asked on these forums. Things like “how do I add friends?”, “how can I get my second city?”, “WTF DON’T I HAZ MY THIRD CITY I HATEZ U KABAM GRRR! ?”, “why can’t I march?”, “how come I can’t conquer a plain?” etc. Following this first section I will begin to talk about the more refined strategies that players can use to become a powerful force in Global Warfare. 1.0) How do I add friends? 1.1) How do I get my second city/conquer a plain? 1.2) Why can’t I march? 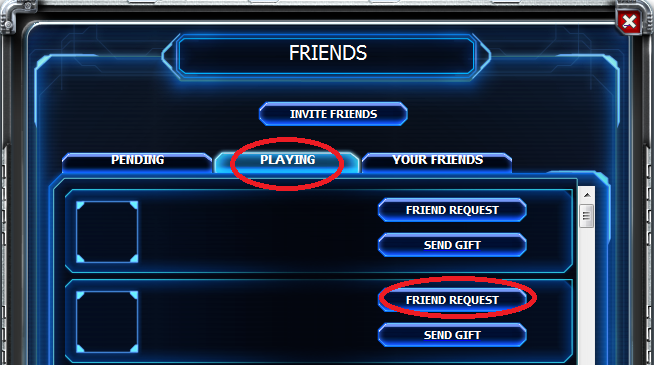 Step 3) Go to the “PLAYING” tab and then click on “FRIEND REQUEST”. This will send a request to an FB friend who is already playing. Alternatively, go to “Invite Friend” … and you can invite someone new to start playing. It is worth noting that sometimes there is lag inbetween adding someone to facebook and them appearing in GW. You just need to wait and refresh when this happens. 1) You need to add 5 friends in game to complete the mission. Once you have added 5 friends click on the mission tab and remember to complete the mission. There might be a bit of lag between u completing the mission and being able to make your second city. But it shouldn’t be too long so don’t worry! 2) Find an unoccupied plain. Lower level is better since you will lose less troops taking it. It’s worth noting that as a server ages there are less free plains so it becomes a necessity for players to attack higher level plains to get their second/third city. You can always ask an alliance friend to help if you can only see level 8+ plains lol. 3) Conquer the plain. You won’t need much to conquer a level 1 or 2 plain (200 infantry does either easily). You will need a free wild in your HQ but since the plain for your second city should be the first wild you attack, this shouldn’t really be a problem. If it is: go to HQ and abandon a wild before you attack. / To attack click on the “attack” button, circled in red above. 4) Once you have conquered the plain, click on it. You will see the option to build your second city. Click on this and the game should refresh and voila, you have your second city! 1) In order to be able to march you need to have UNASSIGNED general in your city. 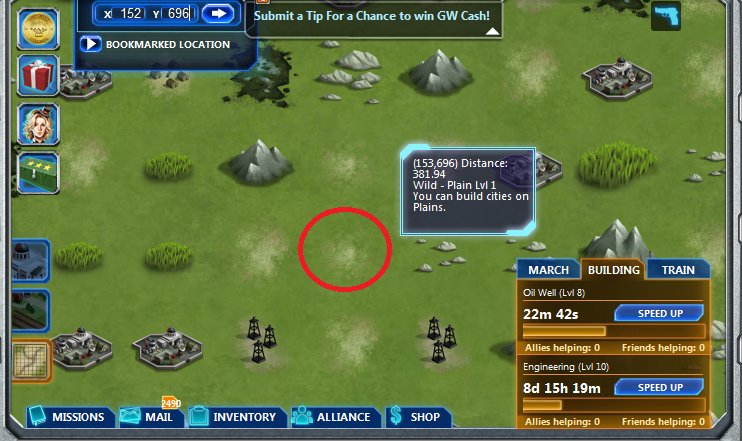 Build a General’s Quarter’s and add your first two generals, (it is best to add people playing the game at first since they will have more energy, which you will need!). 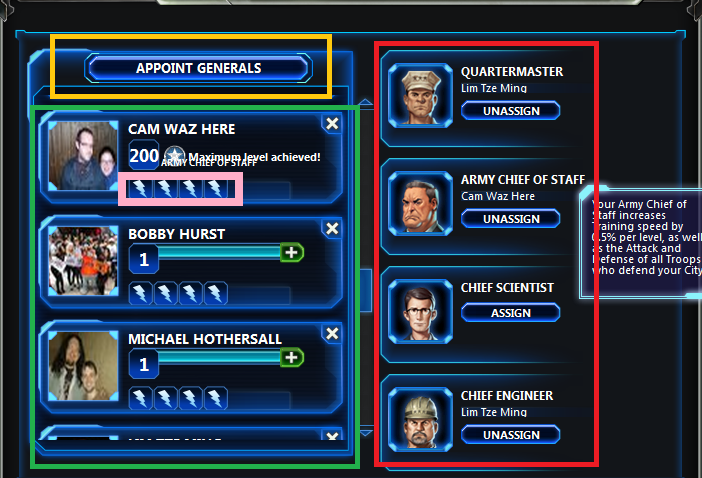 To appoint generals from your FB friends click on the “Appoint General’s” button, (in yellow box). 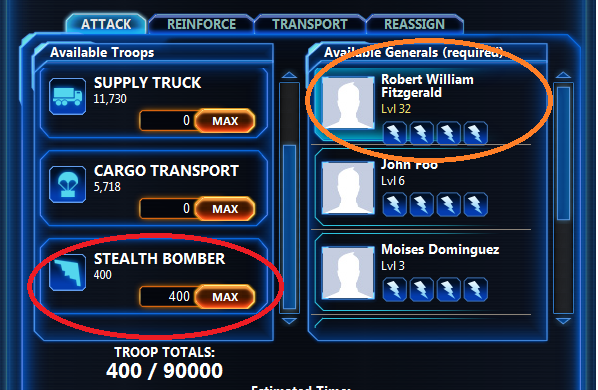 2) Make sure that you have UNASSIGNED generals. You will notice that in the image above, our loveable penguin friend has three ASSIGNED generals, (those in the red box). If our black and white pal only had three generals in total he would need to unassign one of them in order to march. 3) You need ENERGY to march. Your energy is shown by the LIGHTNING BOLTS in the pink box. A general can have a maximum of 4 energy which is refreshed every day. You require energy to march and to appoint generals. Appointing generals can increase the speed you train your troops, mine resources, research new technologies and construct buildings. I will talk more about this later. Taking a third city is much like taking a second, as we have discussed above. The problem that most players will face is obtaining the THIRD CITY PLANS, which are necessary to take the plans. You will need to carry out a LOT of attacks unless you are very lucky. There are five ARTIFACTS that you need to collect in order to create the “third city plans”, the most difficult being the third city blueprints. You can get these artifacts/blueprints ONLY FROM LEVEL 1 CAMPS. The strategy that is most widely used is to attack the camps with say 100 infantry and to mount your attacks so that they all land within 20-30 seconds of each other. So you launch 10 attacks at once and then sit and wait. 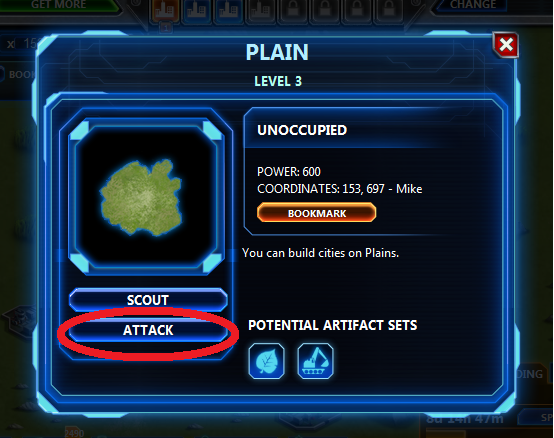 This will minimize your troop losses but does not affect the chance that you will find the blueprints. 1) The attack command has a fairly self-evident function and we saw how to use it above. You use the other commands in much the same way, except the others do not require a general. SOMETIMES, however, you should use a general with the reinforce command. 2) The re-assign command is extremely useful. By using it you can move UNITS between your OWN cities. You can not re-assign units to another player. You can not re-assign generals. NB: Units that are being re-assigned can also transport resources. 3) The reinforce command can be used to reinforce your WILDS, your ALLIES wilds/cities or your OTHER CITIES. You might be wondering why you’d ever want to reinforce another city instead of reassign? You could reinforce city 2 (C2) with 500 stealth bombers from city 1 (C1). This would allow you to HIDE YOUR TROOPS in your HQ (let’s say C2 only had supply copters in it and you were using them to get your resources out), while still buying time to defend. This might not seem like a big deal, but trust me, it can be! 4) The transport command allows you to transport resources BETWEEN YOUR CITIES and also to your ALLIES CITIES. You CAN NOT transport resources to people in alliances that you are not friendly with.